Weather : some cloud and sun, ave 14 deg C.
Another week with 7 fish landed (with an average weight of 12.6lbs) and 2 lost. With the water dropping and remaining extremely clear, the fishing was slightly more difficult this past week. In fact, the first 3 days produced very little to the upstream rods, however the club guys were starting to pick away. I know of 4 caught ranging between 16-19lbs. 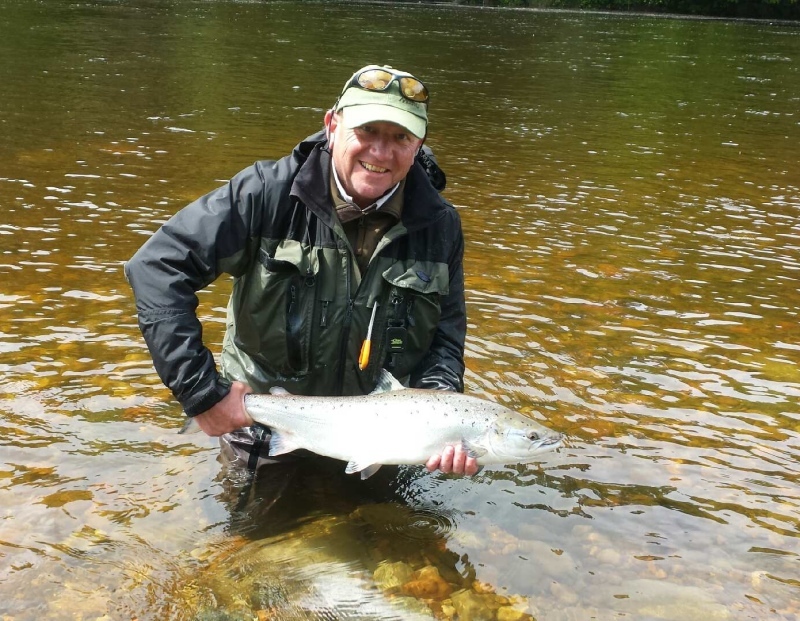 With a change in weather mid-week the running behaviour of the salmon changed also. Fish were seen going through the beats each day, even with the continued lower levels…… obviously knowing a change in river conditions was looming. Sure enough the river rose to almost 3ft on Saturday. Best flies were once again The Sunray Shadow and this little beauty (un-named as yet)….see below. Prospects : Dare I say “this coming week should be good”!!! Week Comm May 9th – Best start in years!!!! 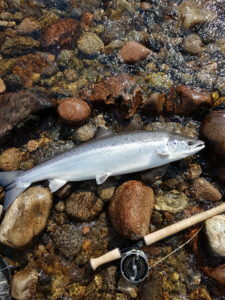 River height : 1ft – 6inch Water temp : 47-53 deg F Weather – cloudless skies, North/East winds and 20+ deg C. A total of 7 fish landed (with an average weight of 15lbs) and 4 lost …….which I’d say is an excellent start to our season given the reasonably light rod effort throughout the week and the prevailing weather conditions. Beats 1 and 2 were the top beats as the fish migrated through the bottom river fairly quickly with the rising water temps. As usual the Sunray Shadow was the best fly in the clear water. All in all a very encouraging start and great to see some early fish splashing about in the pools. Andy Burton – Beat 2. 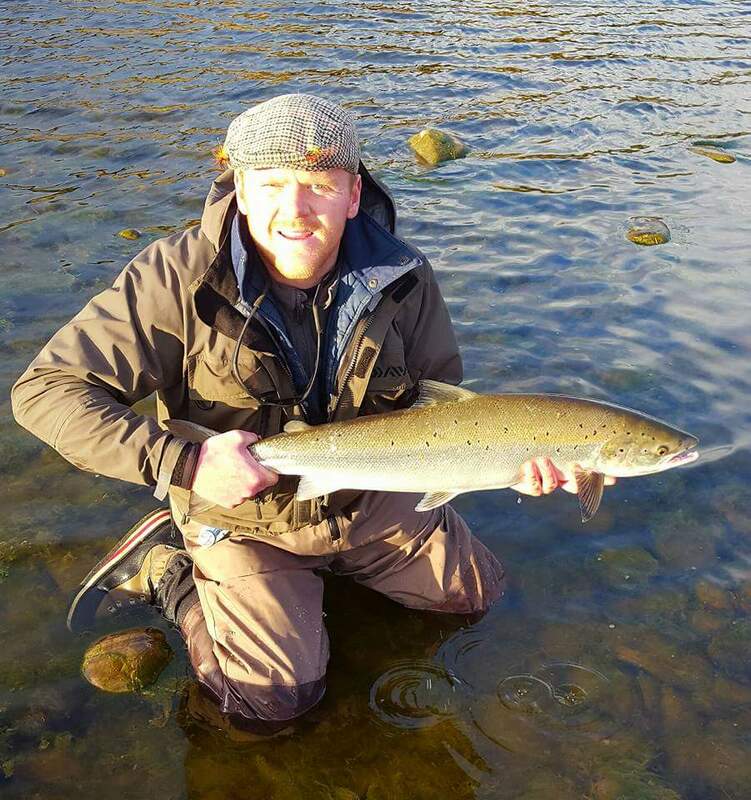 JV – Beat 1 Brian Tolmie – Beat 2 (his 2nd on the season from the same lie) <img class="alignnone size-full wp-image-899" src="http://riverlochy.com/wp-content/uploads/2016/05/tolmie-beat-2.jpg" alt="tolmie-beat 2" width="640" height="360" srcset="http://riverlochy.com/wp-content/uploads/2016/05/tolmie-beat-2.jpg 640w, http://riverlochy.com/wp-content/uploads/2016/05/tolmie-beat-2-300x169 description.jpg 300w" sizes="(max-width: 640px) 100vw, 640px" /> Prospects for coming week – Tides are building and rain is forecast…..we need it now. With a bit more cloud cover and lower daytime temps, the conditions look more favourable however the low water will dictate a bit more thought and stealth to entice a springer to the fly. Weather – cloudless skies, North/East winds and 20+ deg C.
A total of 7 fish landed (with an average weight of 15lbs) and 4 lost …….which I’d say is an excellent start to our season given the reasonably light rod effort throughout the week and the prevailing weather conditions. Beats 1 and 2 were the top beats as the fish migrated through the bottom river fairly quickly with the rising water temps. As usual the Sunray Shadow was the best fly in the clear water. All in all a very encouraging start and great to see some early fish splashing about in the pools. Andy Burton – Beat 2. Prospects for coming week – Tides are building and rain is forecast…..we need it now. 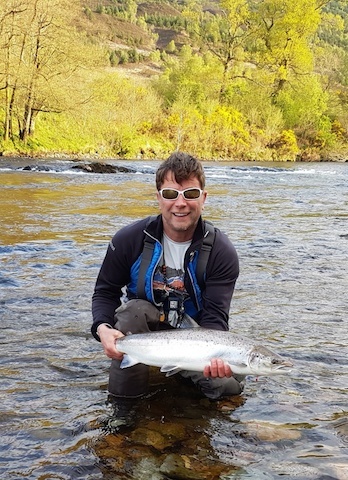 With a bit more cloud cover and lower daytime temps, the conditions look more favourable however the low water will dictate a bit more thought and stealth to entice a springer to the fly. Not a great deal to report this last week. Low rod pressure and less than favourable conditions resulted in only 3 fish being hooked......and lost....and by the same angler. A tad unlucky!! The water remained a good temprerature (@42deg F) but with fluctuating heights and gale-force winds any fish that were entering the river were not showing nor stopping on the beats. This coming sees a proper change in weather. The forecast is for high temps, sun and no precipitation. Summer has arrived!!! Snow melt should keep the water levels and temps at a good level. With more rods on the river, I would expect a fish or two to be landed. Not a great deal to report this last week. Low rod pressure and less than favourable conditions resulted in only 3 fish being hooked……and lost….and by the same angler. A tad unlucky!! The water remained a good temprerature (@42deg F) but with fluctuating heights and gale-force winds any fish that were entering the river were not showing nor stopping on the beats. This coming sees a proper change in weather. The forecast is for high temps, sun and no precipitation. Summer has arrived!!! Snow melt should keep the water levels and temps at a good level. With more rods on the river, I would expect a fish or two to be landed. 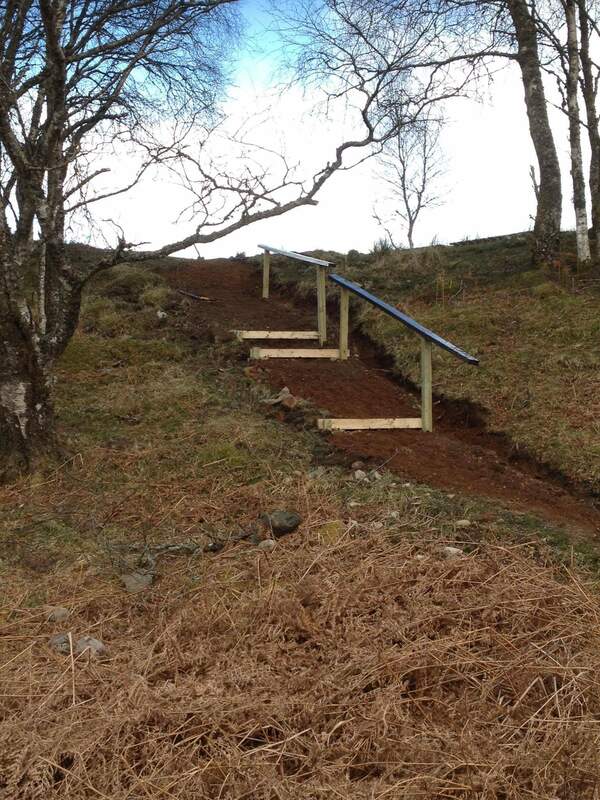 Our remit to build a new hut on each beat and make further improvements on the river bank have continued again in 2016. 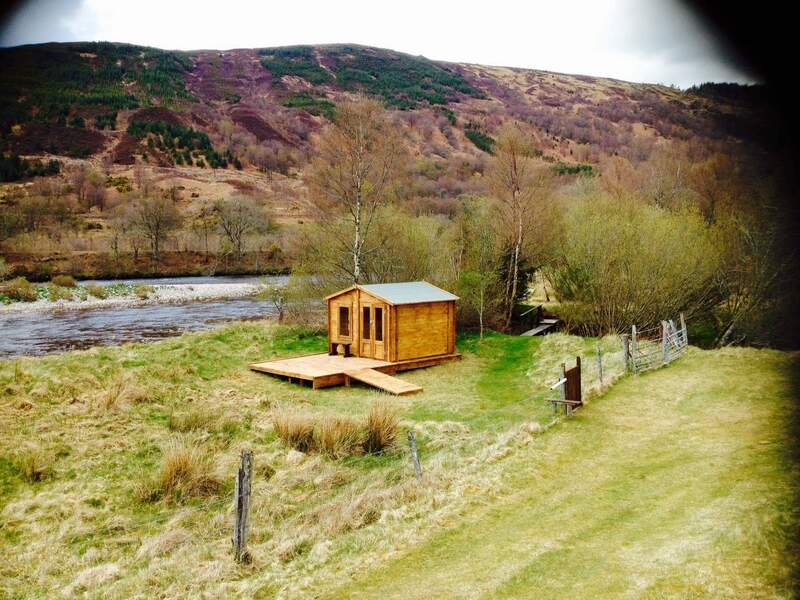 Beat 1 Hut – a great location and the views ain’t bad either. My first day fishing on the river.......... The river - 5deg C, 4inches..... but fishing nicely. The setup - 12ft9 with 8wt rio scandi and 10ft intermediate tip. Small banana colour tube with magenta hackle. The result - 2 fish lost this morning on beat 2......of which one was a heavy fish!!!  The views - stunning!! See below. So delighted to see some early fish in the river. Always a good sign I think! Some much needed rain is forecast over the weekend so a welcome rise might bring in a few more. My first day fishing on the river………. 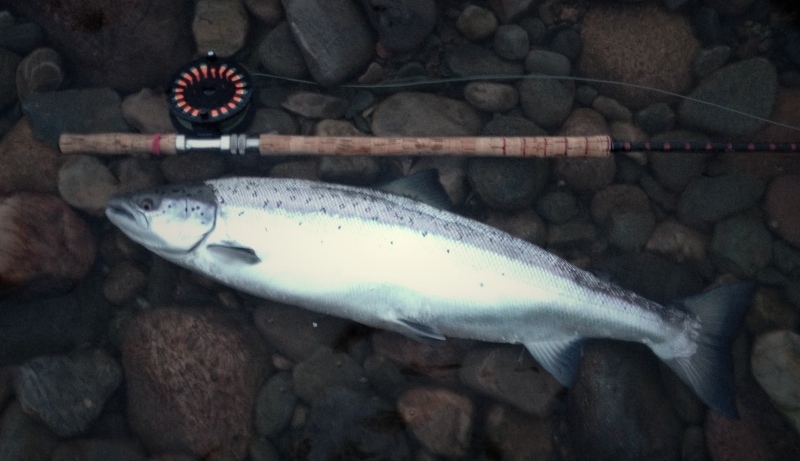 The river – 5deg C, 4inches….. but fishing nicely. 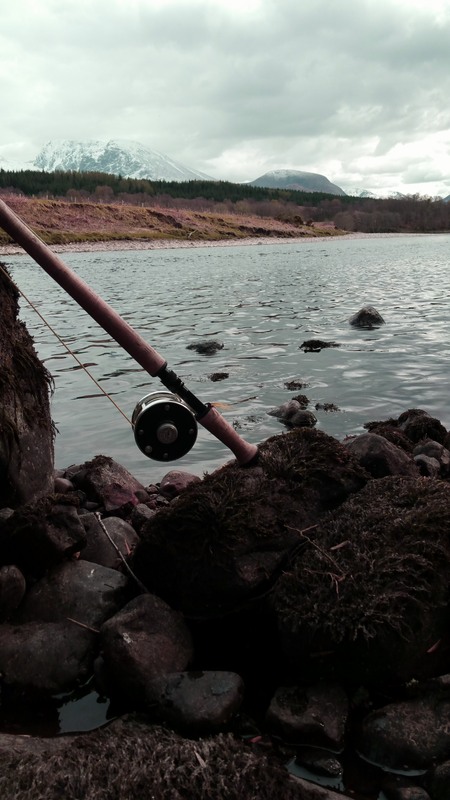 The setup – 12ft9 with 8wt rio scandi and 10ft intermediate tip. 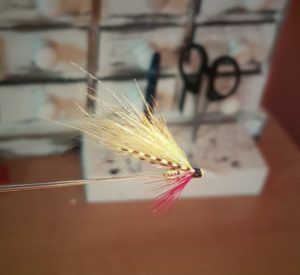 Small banana colour tube with magenta hackle. The views – stunning!! See below. So delighted to see some early fish in the river. Always a good sign I think! Some much needed rain is forecast over the weekend so a welcome rise might bring in a few more. 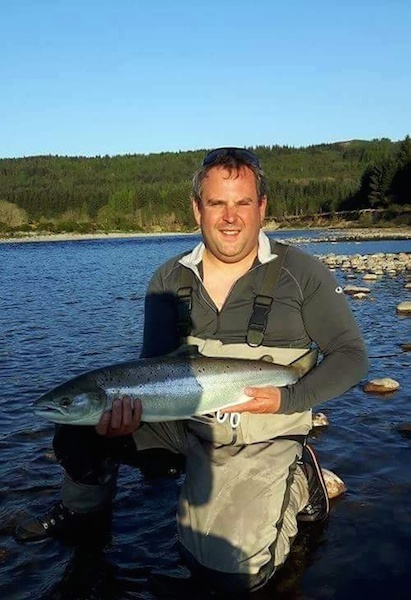 Brian Tolmie lands our 2nd springer of the season. 14lbs from beat 2.